Create a stunning display. Vibrant leaf and flower colour and wonderful fragrance all year round! 12 tried and tested garden winners. Fill any gaps or plant new beds and borders from scratch. Will provide a natural safe haven for wildlife and berries will provide winter food for birds. Supplied as 12 bare root, dormant bushes without leaves, October to April, ready to plant straight out. 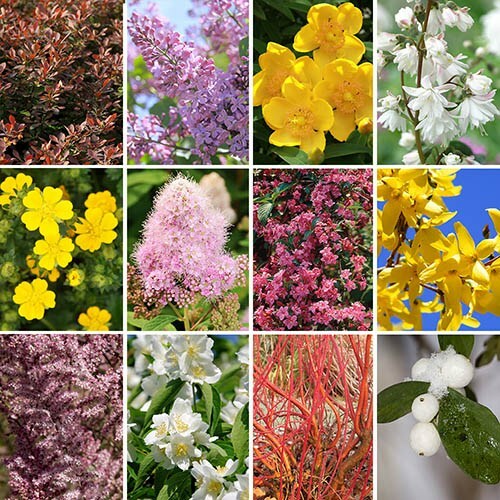 You can now enjoy true year-round interest with vibrant flower colour, brightly coloured berries and stems, tactile bark and wonderfully fragrant flowers - simply brilliant value for money compared to expensive potted garden centres shrubs. These 12 tried and tested garden winners will fill any gaps you might have in your existing beds and borders or allow you to plant a new one from scratch, with each individual shrub having the potential to fill 1m2 / circa 10ftsq. Once planted they will rapidly grow away and look tremendous from this year onwards, providing a stunning visual display and a degree of privacy and security for you, as well as a natural safe haven for a wide variety of wildlife. The berries will provide much needed winter food for wild birds and the shrubby structure will provide cover and protection for them too. Symphoricarpos albus: Known as the 'Common Snowberry' for obvious reason! The berries provide much needed winter food for wildlife. Height 3-4ft. Syringa vulgaris: The common Lilac produces fragrant lavender coloured blooms each May. Hardy and deciduous and great for hedging, it grows to 10-15ft tall. Cornus alba: The 'Red-Barked Dogwood' provides fantastic autumn colour with its bright red vertical branches. In summer it leafs up and even has soft pink flowers in mid-summer. Height 3-4ft. Potentilla ‘Red Ace’: Beautiful scarlet-red flowers all summer long, contrast wonderfully with rich green foliage! Height 2-3ft. Hibiscus syriacus Blue: Exotic yet hardy! Torrents of lavender-blue flowers each summer! Height 4-5ft. Forsythia intermedia 'Spectabilis': Literally one of the most spectacular early season shrubs because of its bright yellow bloom. Perfect for hedges and really easy to grow. Height 4-5 ft. although can be trimmed in to a tidy hedge. Hypericum moserianum 'St John's Wort: Lush green foliage and pretty, bright yellow flowers all summer long. Perfect for a sunny or part-shaded position. Height 3-4ft. Deutzia scabra: Also Known as the Fuzzy Deutzia, this native of Japan & China grows to around 8ft tall and smothers itself in pure white fragrant flowers in June. Berberis thunbergii 'Atropurpurea': A great hedging plant because of its spiky branches, but also a beautiful garden plant. The yellow flowers appear in late spring and the purple foliage provides lovely autumn colour. Height 3-4ft. Philadelphus coronarius: Commonly known as the 'Mock Orange' it will be clothed in a profusion of creamy-white flowers throughout June & July. The flowers are fabulously fragrant. Height 5-6ft. Weigela rosea: A lovely garden shrub, with fabulous pink flower colour in May, June and July. Height 3-4ft. Please note that these plants are supplied dormant and without leaves, looking more like dried twigs, and will establish in the ground over winter. They will not show signs of growth until the weather warms in spring, when they will burst into leaf. Supplied as 12 freshly lifted 2 year old bare-root bushes, 1 each of the varieties listed. Will produce new leaves next spring as the weather gets warmer. On receipt, soak the roots in water for at least two hours (overnight is better). If you can't plant straight away, they should be fine for up to a week if left in a cool, dark, frost-free place - keep the bag around the roots with some water inside. Don't worry if the roots have been cut quite harshly - this is done to encourage the plant to grow. Bare-root plants are dormant, with no leaves, and with the roots out of the soil. The season runs from November to April, depending on weather. Some larger or slower-growing plants will already be a few years old on supply, and ready to thrive straight away in your garden. Select an appropriate spot for your plants, making sure that you give them enough space to grow to their full size. Dig a hole twice the width of the roots, forking over the bottom to loosen the soil, and add some good quality fertiliser such as Blood Fish & Bone. Holding the tree or plant upright in position with one hand, slowly backfill the hole with soil, and gently shake the plant, so the soil falls back around the roots. If you're planting into pots, place some old rocks, stones or gravel in the bottom of the pot for drainage and ballast. Use the best compost you can buy. For all trees, we highly recommend using our Tree Planting Kits. Each contains 3 tanalised wooden tree stakes, 3 soft rubber tree ties and a sachet of Mycorhizal granules. You only need to support the bottom half of each trunk, so push 40cm of each stake into the soil next to each tree. With the soft tie, make a figure of eight around both the trunk and stake, and fasten it off. The tree will now be better protected from strong winds. When the soil and air warm up from late March onwards, you should see the plant burst into life. Do not allow plants to dry out in the first four months after planting. Once established for one season, they will become much more tolerant to a lack of water, as the root system develops. There is no real need to prune for the first two years then prune to the shape and size you want. Remove any broken, diseased or crossing branches in late autumn or winter to control size. Prune established trees in summer using good quality secateurs, removing weak shoots, and cutting out those that cross over each other, to create an evenly spaced bowl shape.